We stayed here for our honeymoon. The cottage was gorgeous and comfortable! We thoroughly enjoyed our time! We visit at least twice a year. The wine and cheese at check in is great and the continental breakfast is perfect! WONDERFUL experience. Beautifully designed, VERY clean rooms, excellent and kind customer service. Bravo! Exceeded our expectations! The friendliness and helpfulness of the hosts were amazing. So many great amenities. We can’t say enough about this adorable place. The owners are a delight! The proximity to downtown is great. The cottage was beautifully decorated and very comfortable. I love how the owners pay special attention to detail. 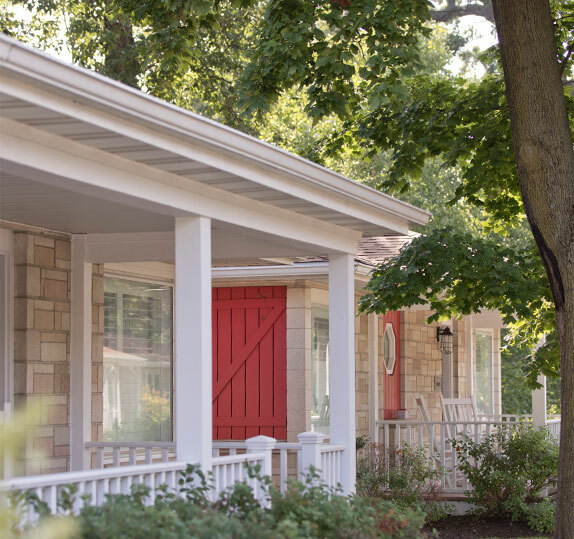 Nestled among mature trees, Seven Oaks bed and Breakfast, offers 13 luxury suites in 11 one-floor cottages – no footsteps above, no footsteps below. 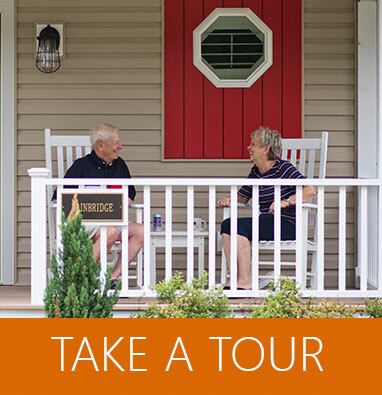 Each suite has a Porch with two rocking chairs, where you can enjoy a relaxing drink after a long day of hiking, boating, horse-riding, skiing or just plain, wandering around. Each cottage features a cozy Living-Room with stone fireplace, 32” LCD TV and comfortable sofa and chaise. The expansive Master Bedroom features a large king bed with luxury linens, and each has an ensuite Bathroom with a romantic 2 person spa tub, large separate shower and the ultimate… a heated floor and towel bar! Two suites Wimbledon and Windemere , offer 2 bedrooms and 2 luxurious ensuite bathrooms , so you can bring your friends and share your living area. Perfect for a romantic getaway , a girls weekend , bridal party , family reunion or corporate getaway. In addition to a ‘good cup of tea’, your hosts provide guests with a personalized welcome , a daily Continental Breakfast and Complimentary Wireless Internet Access (signal strength varies). The coffee is locally sourced from the Lake Geneva Coffee Roastery and provided fresh to us weekly. It is an easy walk Downtown to enjoy the Lakefront, Beach, Shopping and Restaurants. Seven Oaks is a smoke free, pet free, adult (21 plus) resort. Love everything about this special, new found getaway! Welcoming hosts, cozy individual cottages, exceptionally clean, wine and cheese upon arrival, a quiet and private setting yet an easy walk into town. Perfect! Could not have been any better. Probably the cleanest place we have been to and quiet. The separate bungalows made all the difference. Excellently appointed, innkeepers were great, and within easy walking distance of downtown. Would highly recommend. Best place to stay for couples! Joanne and Mick really know how to treat and pamper their guests. The cottage had everything we wanted and more–even a towel warmer in the bathroom! SevenOaks surpassed our expectations! WONDERFUL experience. Beautifully designed, VERY clean rooms – the place looked brand new when we walked in. Excellent and kind customer service from staff. Perfect for a couples retreat. Bravo! Had a great time. Loved the B&B feel with the individual cottages. Welcoming wine and cheese was a nice touch and breakfast was awesome and delivered to our door at the time we chose. Loved the fire pit. We are making this an annual trip! The family and staff are beyond kind. The recently remodeled rooms are complete with new furnishings, new technology (heated floors and a towel warmer in the bathroom), amazing linens. The property is quiet. It’s a quick walk down to the lake and downtown. Breakfast was a fun surprise and different each day!